Now at Great Outdoors, the Garmin Forerunner 375XT! Available in-store & on-line, we welcome you to take a look at the all new Garmin Forerunner 735XT, available as a stand alone watch and also in a “Run” bundle. So, what exactly can the Garmin Forerunner 735Xt do? Read on. You Do It All, Now Your Watch Can Too Be a better athlete on the track and in the water with Forerunner 735XT. 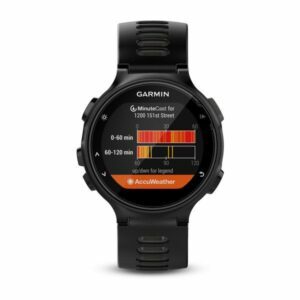 This GPS multisport watch is for athletes who want in-depth data as they train and compete. Thanks to a smaller form and comfortable band, the 735XT is the ideal watch to get you through your workout and your workday. It even doubles as an activity tracker to count your steps, calories and sleep. Get the data you need to beat yesterday. Run, Sprint, Swim, Bike, Tri Your routine is anything but routine. Forerunner 735XT lets you change things up with ease thanks to built-in activity profiles for running (indoor/outdoor), cycling (indoor/outdoor), swimming (pool/open water), cross-country skiing, paddle sports, trail running, hiking and strength training. For brick workouts and du/triathlon races, the auto multisport feature lets you switch sports with just 1 button press. The 735XT is compatible with advanced workouts for running, cycling — and even pool swimming. Create your own custom workouts and download for free from Garmin Connect. Wrist-based Heart Rate Monitors Your Ticker Forerunner® 735XT is our first multisport watch with Elevate™ heart rate technology to measure heart rate at the wrist. Now you can compete with freedom when it’s time to get on your bike or toe the line. There’s no need to wear a chest strap to see your vital stats – see your heart rate zone and beats per minute, all in real-time and displayed on a colourful gauge. Train Your Heart Out Wrist-based heart rate may suit your needs to a “t” on race day, but when it comes to training and recovery, you need more in-depth data. With Forerunner 735XT, you have plenty. Here are some of the advanced metrics you’ll gain with the addition of a heart rate strap: Running dynamics¹ such as ground contact time balance, stride length, vertical ratio and more VO2 max estimate, lactate threshold, race predictor and recovery advisor Underwater heart rate for swimming Prove It With the integration of the Strava Live Suffer Score, you can get street cred for your sweat. Strava Suffer Score analyses your heart rate during a workout and ranks your total activity effort. With the purchase of a 735XT you get a 60-day free trial to Strava Premium, so you can see your suffer score and use it to push yourself harder than ever. Your suffering has value, so use it. Connect and Customise Smart notifications3, automatic uploads to Garmin Connect3 and live tracking make the 735XT the ultimate smartwatch for athletes. Keep your phone tucked away when you’re on a long ride or run and get all your notifications at the wrist so you can decide to respond or keep moving. You can even customise your device with free watch faces, apps and data fields from Connect IQ™.